Observant readers will have noticed a tile ad that appeared in the left sidebar of this site a couple of weeks ago for something called Beer & Butter Tarts. This is a new project being spearheaded by my wife, Sheryl Kirby – with a bit of help from me – and our aim is to build a blog aggregator that gathers together posts from as many food and drink blogs from all across Canada as possible. Canadian Beer News is one of many sources that are currently feeding posts to the site, and we’re looking for more blogs to join the fray. If you’re based in Canada and have a blog that covers any aspect of food and/or drink, please consider submitting it to the pool. 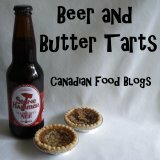 Beer & Butter Tarts only publishes excerpts from posts that are fed to it, with a link back to the original, so the end result will be more traffic to your blog.